8. Schneeberg Trail - schneeberglaufs Webseite! Starting point: Schneeberghalle Puchberg (center). 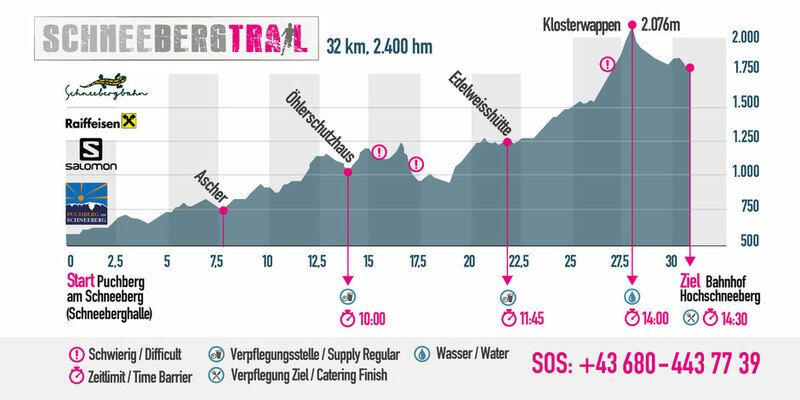 32 km, 2400 m climb, mostly on single trails, through forests up to the alpine terrain of Schneeberg. There are no cups at the supply stations! Clothes bags can be handed out just before the start. The bags are made available by the organizer and transported to the destination at the railway station "Hochschneeberg". Fences etc. are not open, there are crossings etc. to be used. It is necessary to follow the neon pink marking points and arrows on the course, in addition, in particularly confusing places, yellow marking tapes are attached. Disqualification in case of non-compliance of the given route. The obligatory equipment must be carried over the entire course of the route. Backpack or waist belt, min. 500ml water, rescue cover, rain jacket, mobile phone. In case of premature abandonment of the race participants are obligated to call the Infopoint in the starting area or an official catering station. The disposal of garbage along the route is strictly forbidden and is considered a disqualification; garbage can be disposed of at the catering stations. Athletic fair behaviour against other participants and route personnel as well as all other persons along the route is a prerequisite. First aid: Each participant is obligated to provide first aid to injured persons and to inform the nearest rescue post. Instructions for the crew must be followed. When using public roads, the general road traffic regulations must be strictly observed. Participants who have not reached the positions at the indicated times will be taken out of the race. There is no time measurement or evaluation. The return is done at your own risk, cancellation at the catering station or Infopoint is obligatory.